Augusto Maxwell was in Havana recently when his daughter called his cell phone. For most people, it would be an ordinary call -- she was just checking in on him. But Maxwell's daughter was in Miami and he was in Cuba -- an island with no access to U.S. cell service just a year ago. Maxwell realized right away the call epitomized how much Cuba has changed in just a year. "I was in Havana and my phone worked. It was beautiful," says Maxwell, a Cuban-American lawyer at Akerman, a law firm in Miami. Maxwell's moment represents just one of many big changes in Cuba in 2015 -- a year some call a "renaissance" for the island. One year ago today, President Obama announced that the U.S. and Cuba would begin to normalize relations. The historic moment was followed by a rapid change in diplomatic relations, highlighted by an April meeting between Obama and Cuban President Raul Castro. Both countries reopened embassies this year and Pope Francis blessed the new ties with a trip to both countries in September. After 50 years of silence, that's a lot of progress between two governments. American businesses, after decades of being barred from Cuba, were eager to make just as much progress. And at first, change came quickly. Airbnb and Netflix (NFLX) started operating in Cuba earlier this year. Many travel companies, including Jetblue (JBLU) and Norwegian Cruise Line (NCLH), have made plans to increase service to the island. On Thursday, the U.S. and Cuban governments announced an agreement to resume commercial flights between the two countries. Margarita Perez de la Hoz has already noticed a surge in American business and tourists in Cuba. The Havana-based doctor now uses Airbnb and Trip Advisor (TRIP) to rent two rooms in her house to visitors. Perez de la Hoz isn't worried about American businesses coming to Cuba. She sees it as an opportunity and a way to create jobs. "The country needs it," says Perez de la Hoz, 38. This fall, the pace of change picked up even more. Verizon (VZ) and Sprint (S) reached deals with the Cuban government to offer roaming service in Cuba -- that's why Maxwell's phone worked in Cuba when his daughter called. However, the surge of business interest in Cuba has been tempered with the reality of major hurdles ahead. The U.S. embargo is still in place and the Cuban government is taking its time getting to know U.S. firms. Another hurdle is that some of the investments Cuba wants, such as oil drilling, are barred under the embargo. 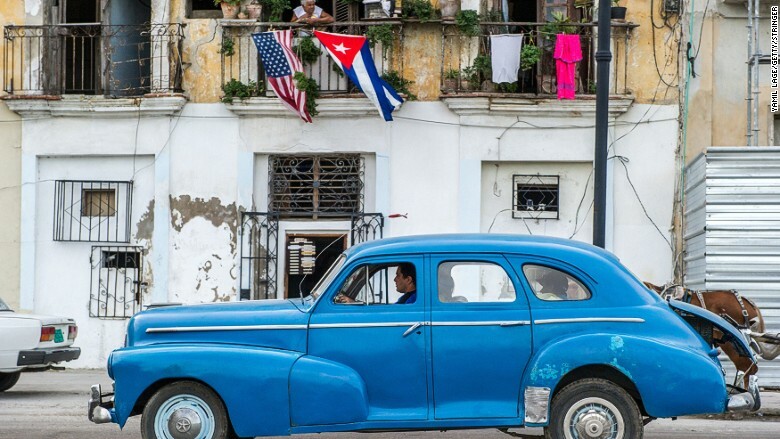 And some of the businesses most eager to get to Havana, such as hotel chains, are not at the top of the government's priorities, says Alana Tummino, a policy director at the Council of the Americas who has led U.S. companies on trips to Cuba. After decades of not talking and drastically different approaches to business, Corporate America and the Cuban government are still just trying to build trust, says Tummino. "There's no lack of excitement" from U.S. firms, says Tummino. But compared to initial hopes,"they realize that this is going to be a longer process." The Obama administration has chipped away at the embargo by amending some business restrictions. In September, new regulations paved the way for a U.S. business to establish a brick-and-mortar store on the island. But ultimately, Congress will have to lift the embargo to truly pave the way. Experts say telecommunication firms are likely to be among the first industries to arrive, possibly as soon as the first half of next year. Cuba badly wants infrastructure for internet and connectivity. Although the business pace may be slower than some would like, virtually everyone agrees it's been a landmark year for Cuba. "This is the beginning of a renaissance," says Pedro Freyre, a Cuban-American lawyer who represents U.S. companies that want to go to Cuba. "We have all seen things we never thought we would see a year ago."